We’d love your help. 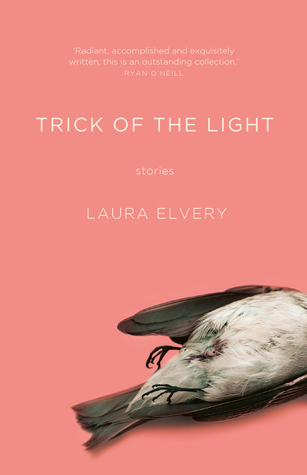 Let us know what’s wrong with this preview of Trick of the Light by Laura Elvery. To ask other readers questions about Trick of the Light, please sign up. A clever short story writer uses each story to immerse readers into a microcosm of a world until we are thoroughly engaged and our hooks have begun to curl into the characters and the setting and the plot, and then as suddenly they wrench us out again, into the open air, where we lie gasping for breath and wondering what just happened. This is exactly what Laura Elvery does again and again in her debut collection of stories, Trick of the Light (UQP 2018). While we are still recovering from one, A clever short story writer uses each story to immerse readers into a microcosm of a world until we are thoroughly engaged and our hooks have begun to curl into the characters and the setting and the plot, and then as suddenly they wrench us out again, into the open air, where we lie gasping for breath and wondering what just happened. This is exactly what Laura Elvery does again and again in her debut collection of stories, Trick of the Light (UQP 2018). While we are still recovering from one, brushing the story droplets from our skin, she immerses us in another, in a completely different time and place; she introduces us to people that are as real and whole and fully formed as in the previous story; she makes us believe that now we are here, in this new place, that this is real and the rest was imagined. And then she does it again. And again. Over and over, with 24 stories, she plunges us into realities that shock with a cold sting. Each story is a skilfully contained vignette, a glimpse into the intricacies of someone else’s life, a direct emotional connection. I am still thinking about the girl with the rosy cheeks who applies radioactive paint to watches; the stranger who showed up at the cabin. The poetic language of A Man About a Moon resonates still. I feel I know Kit and Kayla and Sarah and Marlee. These stories are weighed down by the past or occasionally – as in Dots and Spaces – buoyed up by the future. They speak of love and longing, of despair and distance, of frustration and thwarted ambition. In Brushed Bright Bones, reincarnation seems not only possible, but inevitable, and we wonder why we haven’t noticed earlier. There is the strangeness of For What We Are About To Receive, the childhood reminiscences of What You Really Collect Is Always Yourself, the fear – and anxiety about ageing – in Acrobat. We meet a sinister teacher and a struggling mother. We feel a young man’s acute sense of loss in the wake of a friend’s suicide; the sharp interruption of violence into childhood; the urgent desperation of a refugee. The endings of these stories are never tidy or neat; the endings appear more as a pause in the tale, a temporary cessation. We expect them to start up again at any moment. We imagine them continuing on, even without us as witness. Like all good stories, they leave us wanting more. Like the dead bird on the cover, they hint at what might have been, and at what is no longer; at life cut short and freedom curtailed. What joins these stories together is keen emotional insight, and an attention to detail that brings every character into clear focus. The stories are poignant, distressing, sad, funny, hopeful and searching. They remind us of the many permutations of human behaviour. The myriad cross-sections of people’s lives are rendered through the careful choice of a phrase or a sentence that sings with meaning. This feels less like a collection by the one author, and more like a collected volume of stories by different authors, each accomplished in their own way. Trick of the Light: objectively, I can see the value and merit; subjectively, it just didn't compel me. The way Elvery captures small moments, glimpses into lives, is impressive. I particularly enjoyed the variety of the stories amongst protagonists of varying ages and genders, the use of different narrative perspectives, and different countries of setting. Elvery also tackles some difficult subjects in such short stories. She deftly handles those topics and presents interesting interactions betw Trick of the Light: objectively, I can see the value and merit; subjectively, it just didn't compel me. The way Elvery captures small moments, glimpses into lives, is impressive. I particularly enjoyed the variety of the stories amongst protagonists of varying ages and genders, the use of different narrative perspectives, and different countries of setting. Elvery also tackles some difficult subjects in such short stories. She deftly handles those topics and presents interesting interactions between these subjects and her characters. Here's where my subjectivity kicks in, though. It's not necessarily a direct criticism of Elvery's work, but one that can certainly be widened to encompass much of the 'literary' world. So much of it is mighty gloomy. I would have enjoyed this collection much more had there been more of a balance of stories that reveal happy moments. Because, yes, Elvery did tackle important topics. But when inundated with so many, it is easy to emotionally disconnect. In a series that highlights small moments in everyday lives, I would have valued it more if it continued to explore those important themes, but sometimes with a more positive spin, as in the final story Caius Atlas. Sexual harassment, suicide, death, refugees, infidelity, abuse; they're all big ideas, big topics. I just felt like there was room to highlight hope, too. A beautiful collection - lots of powerful, memorable moments with real depth of feeling and so many rich, real characters. What a beautiful thing. We get real characters rendered so thoughtfully. Fragments of lives and stories fully realised. A proper gem. *This remains probably my favourite book of the year so far. It is a shame that so few collections of short stories by debut Australian authors ever make it to press in Australia, and even fewer receive the critical attention they deserve. With Laura Elvery's Trick of the Light, UQP proves once again that they remain one of our premier publishers of literary short fiction. Elvery's writing has appeared in literary magazines around Australia, including The Big Issue Fiction Edition 2015 (Issue #49 *This remains probably my favourite book of the year so far. It is a shame that so few collections of short stories by debut Australian authors ever make it to press in Australia, and even fewer receive the critical attention they deserve. With Laura Elvery's Trick of the Light, UQP proves once again that they remain one of our premier publishers of literary short fiction. Elvery's writing has appeared in literary magazines around Australia, including The Big Issue Fiction Edition 2015 (Issue #491), and she has collected her share of short fiction prizes over the years. She has a deft touch when it comes to words and phrasing, often transforming the ordinary into something magical, as when drilling rigs stand as 'statues of light against the burnt sugar sunset' or slices of orange fall 'on their backs like beetles'. But the cheerful watermelon-pink cover marred by the body of a dead bird is particularly apt, and this collection has some sharp edges and a certain darkness at its heart. Elvery has a significant talent for creating suspense and her ability to shock the reader with a sudden twist or deflate our expectations with an abrupt ending make for unsettling reading. Many of these stories share a looming sense of dread which hangs over the characters like a black cloud, and it is partly this dark sensibility that helps to form the clear sense of cohesion that marks the collection. She tackles difficult subjects that include death, suicide, abuse and domestic violence. But there are also moments of light among the shadows. Childhood innocence is a recurring theme, and there is a certain sense of humour threaded through, in places, to lighten the mood. In particular, the biting satire of 'Pudding' is a welcome change of pace. It is almost impossible to pick one standout among the twenty-four stories collected here, but the award-winning 'Joiner Bay' is a highlight, while 'Fledermaus' and 'The Republic' were personal favourites. Trick of the Light is an accomplished debut for such a young writer. Laura Elvery's masterful command of literary technique and her ability to manipulate her readers' expectations and responses so precisely are sure to guarantee her a bright literary future. A brilliant collection of powerful, fully realised short stories. Each story is utterly self contained, with a mixture of settings, genres of story, and a full cast of multi-dimensional characters from various backgrounds. Reading Trick of the Light is everything I love about short stories, and I can't wait to read more of Elvery's writing. A wonderful collection of stories that know just how much to reveal and how much to keep to themselves. I enjoyed this short story collection, with 'Pudding' and 'Mountains Grow Like Tress' being some of my stand out favourites. I love books which provide a glimpse of peoples everyday life and the way in which Elvery challenges readers on themes of gender based harrasment, violence, discrimination and power imbalance was, in my opinion, well done. However I found that as soon as I became invested, the vignette would end leaving me wanting more and wondering.... what happens next. I think think thi I enjoyed this short story collection, with 'Pudding' and 'Mountains Grow Like Tress' being some of my stand out favourites. I love books which provide a glimpse of peoples everyday life and the way in which Elvery challenges readers on themes of gender based harrasment, violence, discrimination and power imbalance was, in my opinion, well done. However I found that as soon as I became invested, the vignette would end leaving me wanting more and wondering.... what happens next. This was a rather sombre and sad collection of stories. There were alternating light and dark aspects of the stories. Stories generally involved one tiny part of someone's life; an experience, an emotion or a craving. I felt like I was left hanging a little by them, wanting a better conclusion, or a conclusion at all. One of the best books I’ve read this year! Every single story is charming and moving in its own way. The characters are real and interesting and it feels like peeping into a day in the life of a stranger you just passed on the street. The writing is beautiful but down to earth. All in all a thoroughly enjoyable read. Really nice collection of short stories, each one distinct from the others. Recommend checking it out if you're interested in getting into short stories and/or Australian authors. My personal favorite was 'North'. idk, it felt so 'Australian' in a way. Towards the end, it almost felt like a satirical comedy sketch you'd see on the ABC. Plus, I just find PR insanely interesting. In each of the 24 short stories in this collection, the reader's lens is drawn to "this" moment or "that" time for the character at the centre of the story, while their pasts or futures are kept tantalisingly but deliberately distant. Such restraint made this collection a joy to read. Most of these stories hit the mark for engagement and writing quality. So many of them juxtapose something mundane against something shocking or exciting. Bought this on a whim from Brisbane Writers Festival, after having missed the author talk. Good find. Every single one of the 24 stories is worth writing home about. Spanning styles, time periods, and genre, each story in this collection is potent and polished. It's hard to think of a short story collection I've read that's been this consistently good.